Get 20% off in May! It’s been a while since our last check-in — we thought it was about time to let you know what we’ve been cooking up in the WP Job Manager kitchen! Looking for a snippet to customize your form? We’ve gathered all the available code snippets on one page. We’ll keep adding snippets here regularly so everyone can customize our plugins according to their own needs. We’d also like to invite you to contribute: if you wrote a snippet that changes, adds, or removes functionality from WP Job Manager, let us know. We’d like to populate the Snippets page with thousands of snippets. Sharing is Caring! If you don’t create your own snippets, we still want your input: tell us which snippets you found useful, which ones you’d like to see, or which ones aren’t worth their salt. We’ll review each of your comments there and make sure that snippets you love the most find their way into the core plugin. People often ask, “May I have a discount for the core add-on bundle?” The core add-on bundle already has a discount included — but in May you may have a special 20% discount. The coupons are valid for the purchase of one core add-on bundle, Personal or Developer license. The links will be valid until May 31st, so make sure to use them before then! The plugin now plays nicely with the latest WooCommerce 3.x version — Job Packages Subscriptions no longer default to Simple Products, so you can select the appropriate options. We migrated away from deprecated WooCommerce 3.x properties, methods, and functions. Shortcodes are updated and use WooCommerce 3.x’s new visibility terms when querying for products. 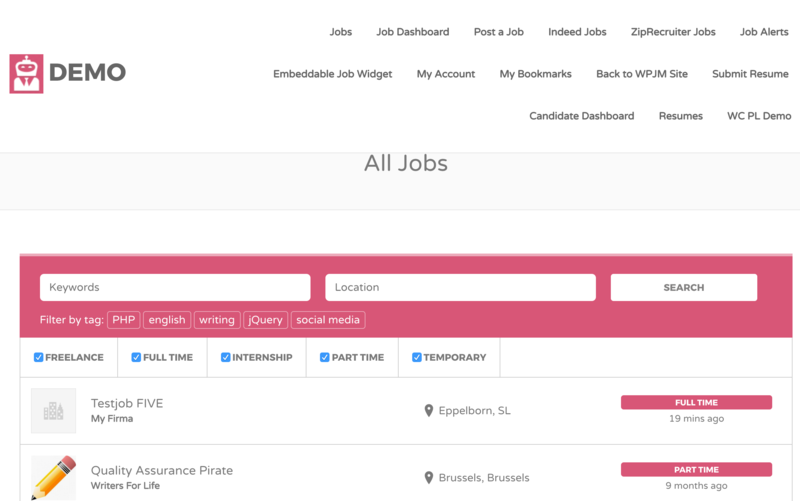 A short description for resume products is now displayed just as it’s displayed for the job products. We added a chunk of code to prevent the duplication of user records when subscriptions are renewed. Remember how resume fields were shown on the product edit screen even when the resume plugin wasn’t active? That’s fixed now. Made the license notice issue a thing of the past. You can now search the entire post meta value. Resumes could be edited by other logged in users, which was…. not great. We fixed it. The redirect issue after previewing — in the WC Paid Listings plugin workflow, when the package selection would come before the listing submission — was also less than ideal, so we fixed that as well. The hook before_get_resumes is now properly called. The action the_candidate_video_embed is called when necessary. That pesky license notice issue – gone here too. Fixed the problem with the resume_manager_user_can_view_resume filter. Added get_resume_attachments() function to fetch URLs and file paths. The demo site now lives at demo.wpjobmanager.com. (We know, it’s about time.) We polished the demo site a bit and added a whole new flow for paid listings. On demo-wcpl.wpjobmanager.com, you can also see what the listings submission flow looks like when you’re using the WC Paid Listings add-on (compared to the original site, which uses the Simple Paid Listings add-on). We’ve crosslinked the sites, but you can also check each of these flows separately. We’re going to continue releasing new versions of the core plugin and our add-ons. Lots of patches and enhancements are on their way in the next few months. And we’ll keep you regularly updated on what we are up to. Questions? Concerns? Suggestions? Feel free to comment, or contact us directly via our support or pre-sales channels. July has discount or not? Thanks!! No discounts for July at this time. Hello! There are no discounts available at this time, but note — the Core Addon Bundle includes all of our addons at a discounted rate.